A Monrovia couple got hitched under the rare light of the blue moon on Friday, July 31, 2015. 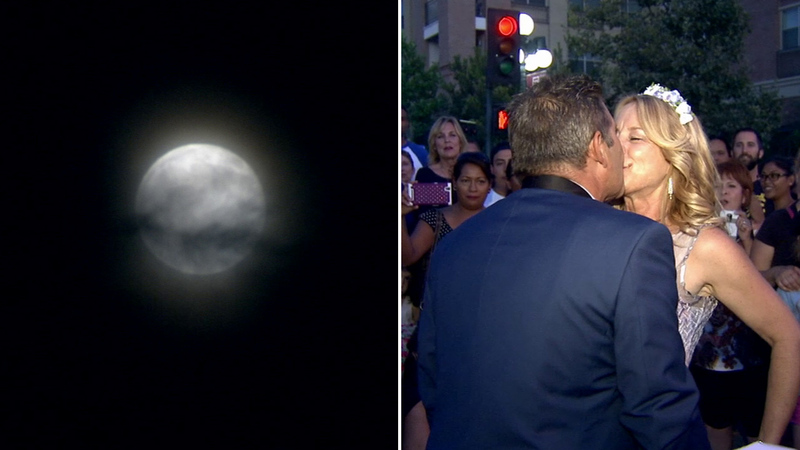 MONROVIA, Calif. -- A Monrovia couple got hitched under the rare light of the blue moon. Franchie San Pedro and Heather Forsha shared their special moment with dozens in Old Town Monrovia. They were planning to have a small celebration, but word spread and it grew into a much larger party. San Pedro says the blue moon added an extra touch of romance for their late-night nuptials. The two lovebirds met online five years ago and have been inseparable since. Friday night was the second full moon in July, a phenomenon which is called a "blue moon."